It's finally done! 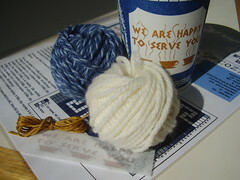 Kits and patterns to make your own Greek Deli Cup Coffee Cozy are now available in my etsy store, halfbirthday.etsy.com. 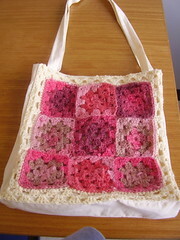 The pattern is available in pdf format. The kit includes: 100% wool in blue and white, embroidery floss, pre-printed interfacing embroidery pattern, 2 page full color pattern in plastic sleeve. Kit does not include knitting or embroidery needles. Or coffee. If you buy one and make one, please send me photos! I finished this, this past week. I wanted to learn how to crochet to improve my knit skills, and since my mom is a crocheter, the last time I saw her in April, I asked her to show me how. She made the center square to demonstrate a granny square. I continued making squares until I ran out of yarn and then decided to see how I could piece them together to make something. One ball got me 9 squares so I decided on one side of a tote. I needed it a bit bigger, so I after I pieced it together using slipstitch through the back loop, I added 2 more rounds of the granny square pattern. I sewed the tote out of double layers of muslin, and used a tutorial about squaring pockets that I found via the CRAFT blog. It has pockets for phone, wallet, and pen. I want to do something fun on the back side as well, possibly trying to embroider with my sewing machine, and I'd also like to add another pocket for my ipod. But I couldn't wait to finish and use it. I've been using it for 2 days. Thanks, Mom! 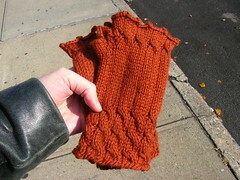 A convertible mitten hybrid of knitty.com's Fetching and subway knitter's Urban Necessity from Magknits. I knit and love a pair of Fetching mitts, but I needed something warmer for this past winter, so I melded the two patterns, choosing the Fetching cable detailing and single opening for the fingers, and the Urban Necessity's flip top construction. Check out my flickr page for more detailed photos. I began this back in May, intending to enter it in whipup's cozy contest, but didn't finish on time. 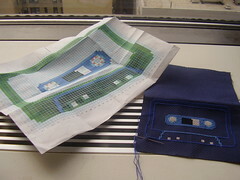 I designed the cross stitch patterns for front and back. I wanted to juxtapose the mix tape (DIY music) with something traditional, so I went with a check pattern and twining flowers. 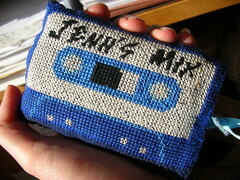 I had intended to thread a ribbon through the cozy along one side to mimic the magnetic tape/openings on the side of a cassette, but had difficulty matching the edges of the cross stitched images and the edges of the iPod and openings. 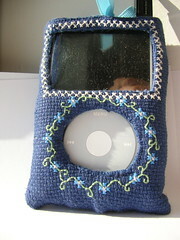 I think this was because I wasn't able to calculate finished dimensions properly, because I used quilt batting to give the cozy some cushioning protection for the iPod. The resulting seams were difficult to sew and came out a little wonkier than I would like. On the whole though, I'm pretty pleased with how it turned out. It took longer than expected. 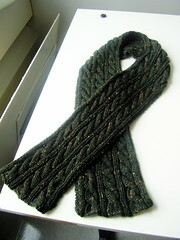 The hat and scarf together took 4 balls of Patons Shetland Chunky Tweeds in Dark Forest. Very soft and a nice manly knit. Wow! 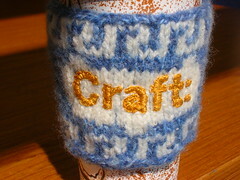 2 days in a row on the CRAFT: blog. Thanks to Natalie and Ansley of Bleu Arts! 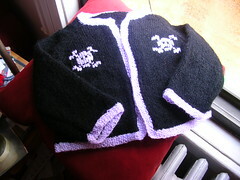 The same sweater, knit in the smallest size for my college roommate's baby. Much better. 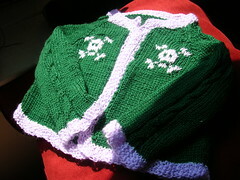 The yarn was much nicer and I did intarsia instead of duplicate stitching. 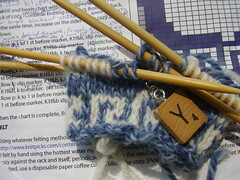 I also added a cable up the sleeve to break up the stockinette. This one could have used a closure as well, but just at the top. This is the first sweater I knit, for my niece Jadyn. The yarn was very fuzzy and there were long stretches of boring stockinette. I should have put some buttons. Well, I've been absent from my own blog. I would like to build up to posting regularly, but in the mean time, it's going to need to be more of a showcase for finished objects. So here's the first. 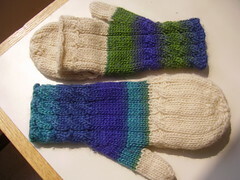 Like everyone else, I made a pair of Fetching mitts.